The U.S. Embassy in Mexico City issued this news release on Thursday Oct. 27. 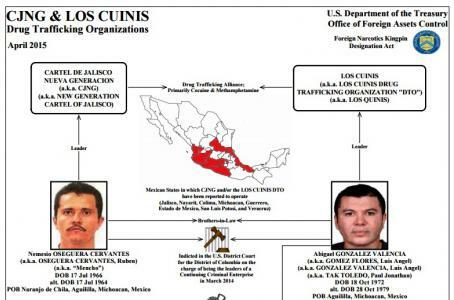 Washington—Today the U.S. Department of the Treasury’s Office of Foreign Assets Control (OFAC) sanctioned nine Mexican individuals linked to the Cartel de Jalisco Nueva Generacion (CJNG) and its close ally, the Los Cuinis Drug Trafficking Organization (DTO), which were initially sanctioned on April 8, 2015. The nine individuals are designated as Specially Designated Narcotics Traffickers (SDNTs) pursuant to the Foreign Narcotics Kingpin Designation Act (Kingpin Act) for providing material assistance to the drug trafficking activities of Nemesio Oseguera Cervantes (a.k.a. “Mencho”) and his brother-in-law, Abigael Gonzalez Valencia, the respective leaders of CJNG and the Los Cuinis DTO. As a result of today’s action, any assets these individuals may have under U.S. jurisdiction are frozen, and U.S. persons are generally prohibited from engaging in transactions with them. In March 2014, based on an investigation led by the Los Angeles Field Division of the Drug Enforcement Administration (DEA), a federal grand jury in the U.S. District Court for the District of Columbia indicted Nemesio Oseguera Cervantes and Abigael Gonzalez Valencia on several narcotics-related charges, including being the principal leaders of a Continuing Criminal Enterprise. Gonzalez Valencia was captured by Mexican authorities in late February 2015, but Oseguera Cervantes remains a fugitive. The Treasury Department and the DEA Los Angeles Field Division worked closely in order to execute today’s action.